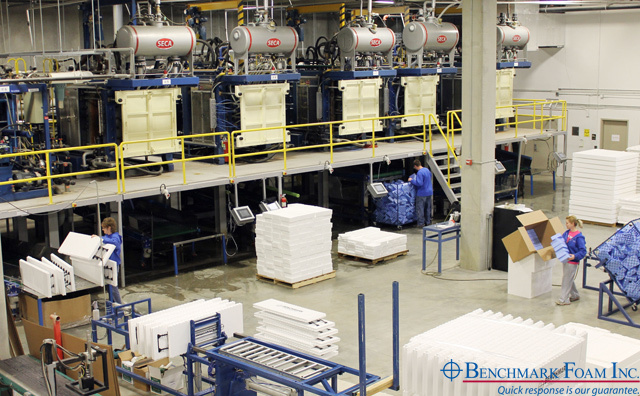 There are several elements that make up Benchmark Foam's quick response and On-Time Guarantee. First, our employees take pride in their work and do what it takes to get the job done. Secondly, our new equipment allows us to do more in less time. And don't forget that we wouldn't be in business if it wasn't for our loyal customers that challenge us to make more time saving and energy efficient products. In the last few years, our employees have grasped lean manufacturing principles in a way that we never expected. They've formed committees creating goals among departments to exceed standards on a daily basis – and raise our company standards as a manufacturer. Our employees are a significant reason why Benchmark Foam can boast its superior quality products backed by the industry's only On-Time Delivery Guarantee. In 2009, Benchmark Foam had the opportunity to upgrade to the latest technology in expanded polystyrene (EPS) molding equipment. This upgrade allowed us to mold more parts at faster speeds and even higher quality. Upgrading to the newest equipment lowered our utility costs, giving us the opportunity to pass those savings on to our customers. This new efficiency allows us to be even more competitive in the EPS industry. At the end of the day, none of our improvements would have an effect, if we didn't keep a solid customer base. It's our customers that allow us to continually exceed standards and create new products that save their money and simplify their job. Next time you're thinking about packaging a new part, building that shed, remodeling the basement or installing a new roof, call the Benchmark Foam team at 605-886-8084 or 800-658-3444. You'll be surprised at all the ways we can save you time and money with our quality products and On-Time Guarantee. to improve quality and productivity.